Traveling somewhere beautiful and staying in a luxury hotel where your every need is catered to sounds like a dream come true. But no matter where you go or where you stay, there’s always been a void in your heart — something missing — a primal need that no hotel has ever managed to fulfill. What is it? Yes, it’s the need for speed! Well be left longing no more, your new best friends at Waldorf Astoria Hotels and Resorts are here to save the day with the Waldorf Astoria Driving Experience. 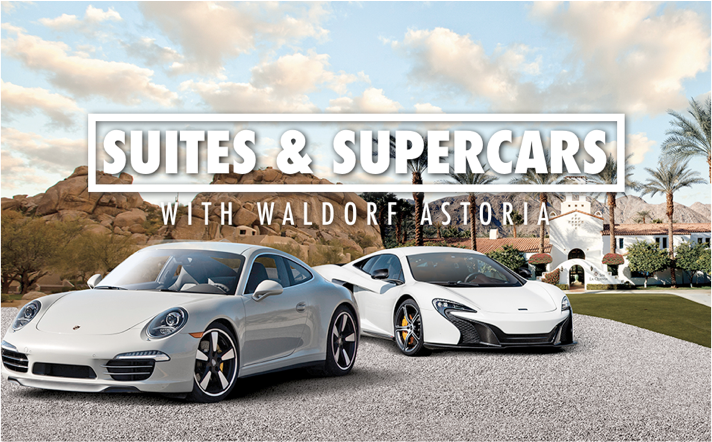 Now this is where you leave the mundane “dream come true” territory behind and enter the realm of fantasy, because Waldorf Astoria has secured three supercars for you to drive: a Ferrari 458 Italia Spider, a McLaren MP4-12C and a Porsche 911 Turbo. And no, you won’t have to choose, you’ll get to drive all of them. The experience will make appearances at six of Waldorf Astoria’s properties throughout the United States from September 30, 2014 to December 7, 2014, stopping at each for just six days (more on that below). At each location, you’ll be lead by acclaimed Belgian race car driver Didier Theys who has selected a pre-determined route which includes turns, twists and straightaways. The drive will last two and a half to three hours and a professional photographer will be standing by to capture a shot of you looking awesome behind the wheel (say hello to your new Facebook cover photo and/or 12-year-old style poster for your wall). To give you a taste of what you’re in for beyond the supercars, let’s briefly talk about the suites using the stunning Waldorf Astoria Park City (where the experience kicks off) as a prime example. Located at the base of Canyon’s Resort, The Waldorf Astoria Park City features a refined mountain vibe and residence-style suites with private balconies, full kitchens, fireplaces and overside soaking tubs. And since driving supercars can really take it out of you, the hotel has a 16,000 square foot spa to recover in.